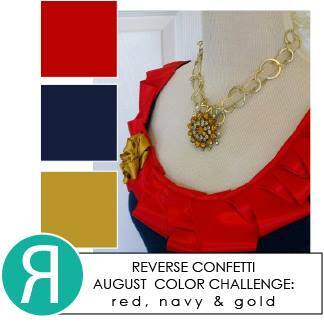 Reverse Confetti's August Color Challenge is up, and the entries so far are fantastic! If you haven't played along yet, there is still time. The deadline is noon on Friday, August 29. Head over to the Reverse Confetti blog for all the rules and to link up. I loved the nautical feel of the red, blue, and gold, so that's the direction I went. 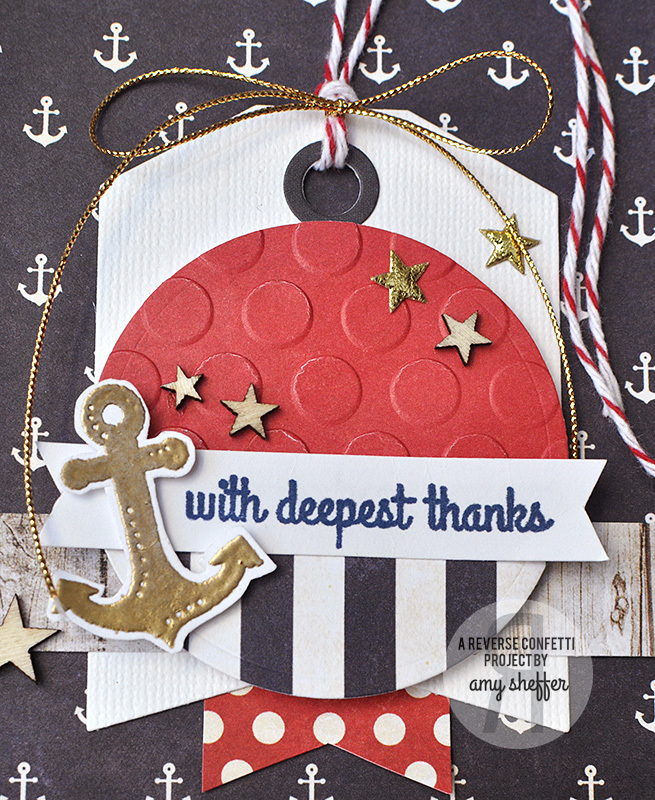 The darling anchor in HAPPY HARBOR is one of my all-time favorite Reverse Confetti images, and I love how it looks embossed in gold! 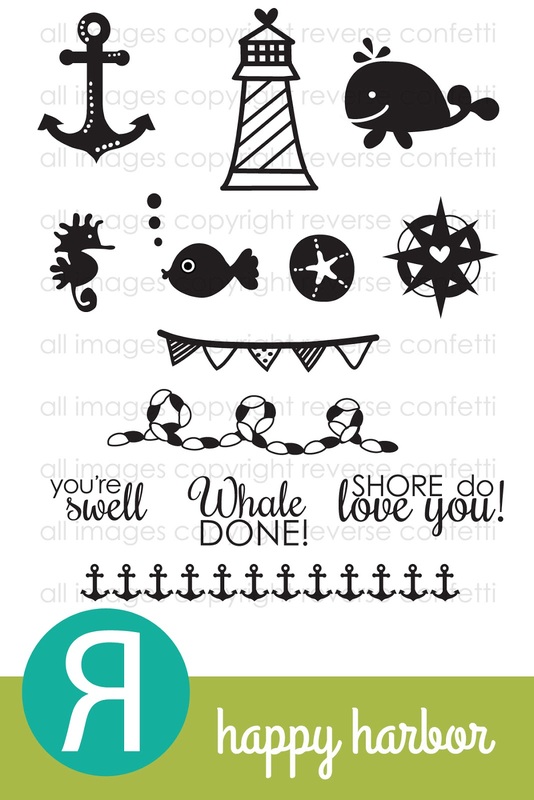 There are two sentiments in the HERE WE GO set that are perfect for the anchor: "with deepest thanks" and "from the bottom of my heart." (I chose the first one simply because the size worked better.) 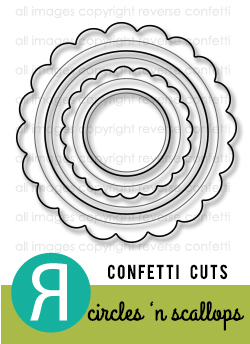 The tag is die-cut with TAG ME CONFETTI CUTS, and the circle was first die-cut with one of the circles from the CIRCLES 'N SCALLOPS CONFETTI CUTS set, then partially dry embossed with the large circle pattern. 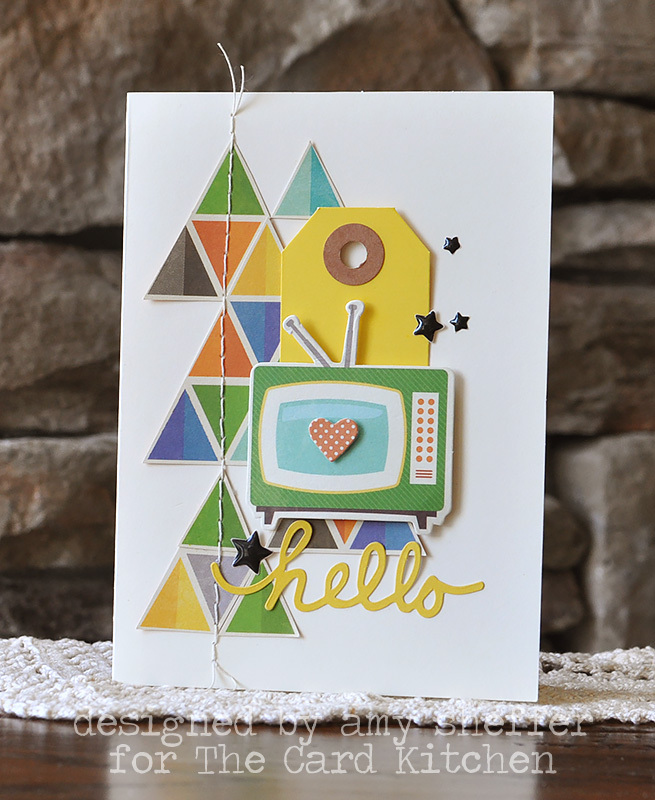 The anchor pattern in the background makes the card a tad busy for my liking, but it was too perfect to pass up! 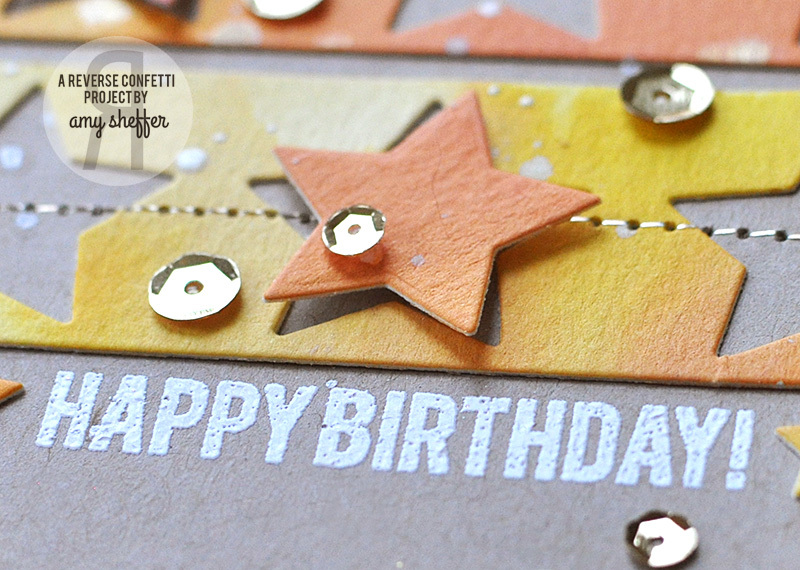 It's hard to tell in the photos, but I also used some Stampin' Up brushed gold card stock for the card base. Love how it looks in real life! 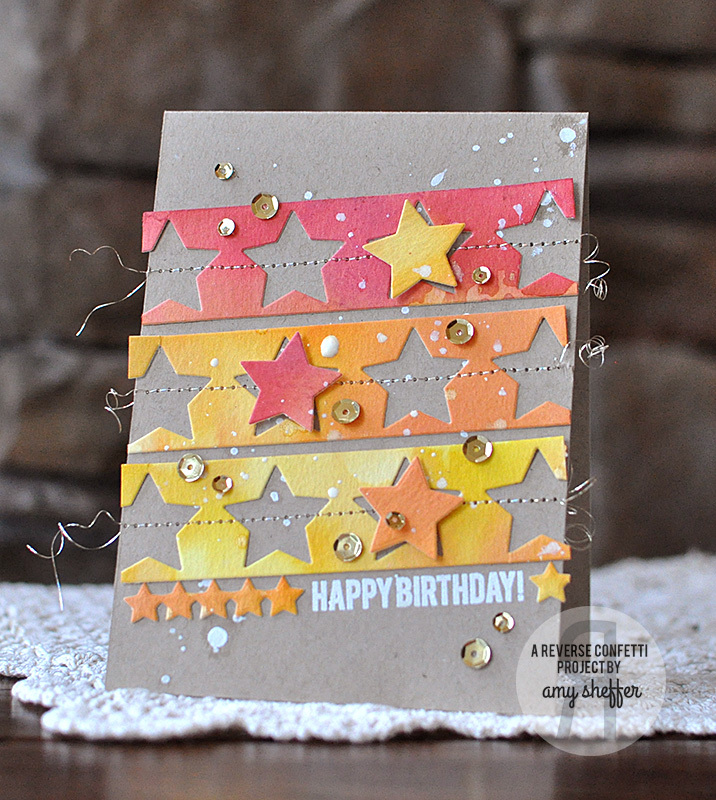 For more color challenge inspiration, see today's post on the Reverse Confetti blog. CASE Study 4th Anniversary Hop! 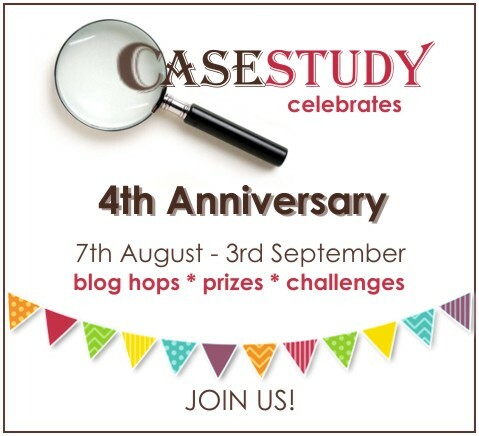 The fabulous CASE Study challenge blog is celebrating its fourth anniversary! 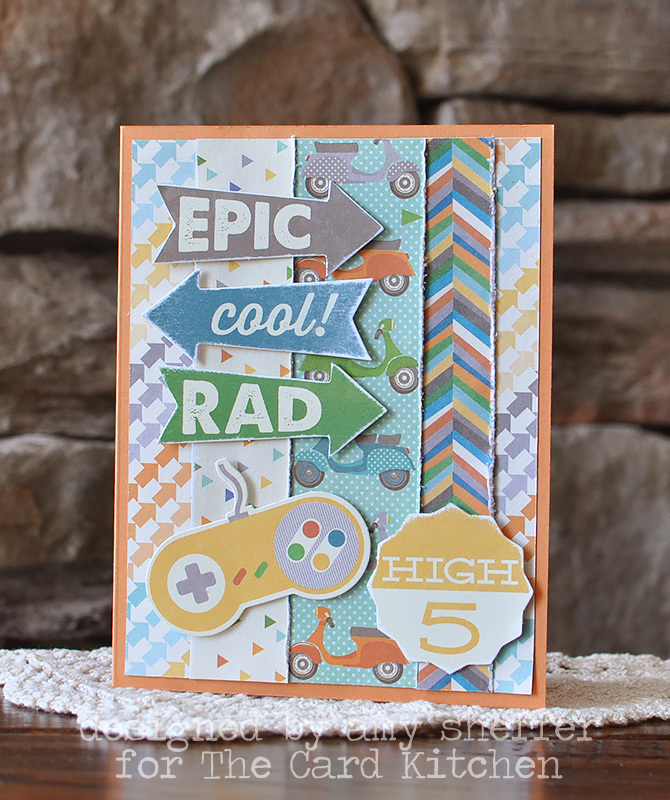 Today's blog hop is the third hop in a series of four hops featuring former guest muses as well as current and past CASE Study designers. If you missed the first two hops, you can find them HERE and HERE. Tune in again next Thursday for the fourth. Our theme for these hops is "inspiration." 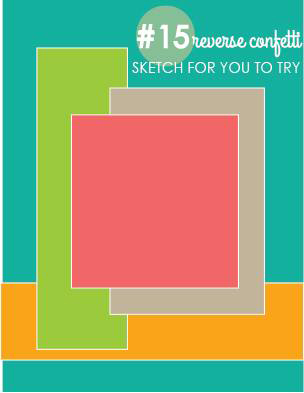 In true CASE Study spirit, I decided to choose another paper crafter as inspiration. I knew exactly who and what to case: Dawn Woleslagle and her beautiful bokeh made easy technique. 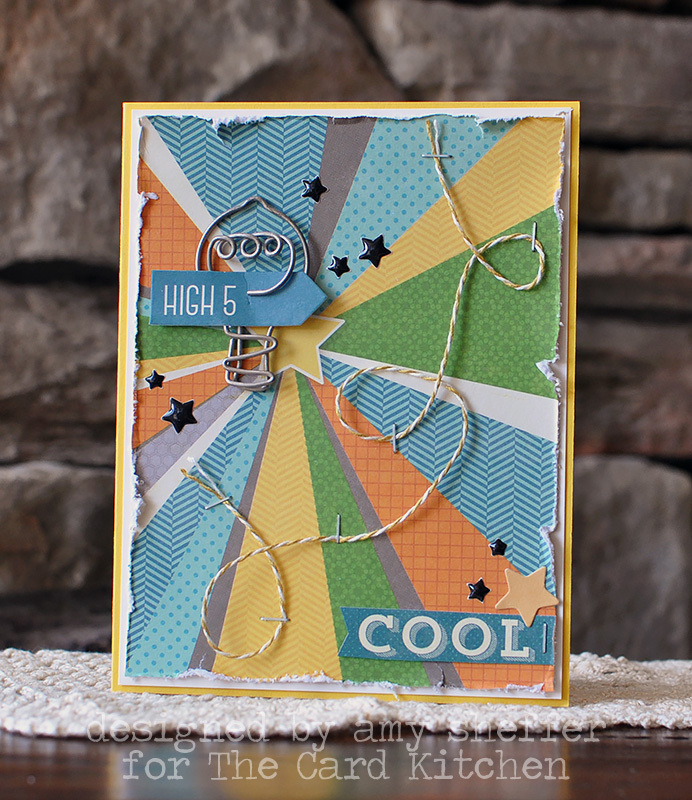 Click HERE for her card and video tutorial. 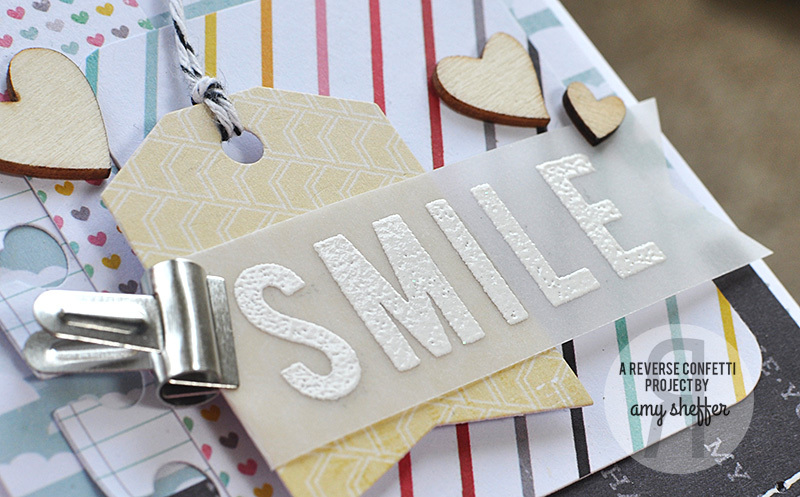 A cute wood veneer camera and a fabulous sentiment from Reverse Confetti's YOU MAKE ME SMILE were both perfect fits for the bokeh look. And I love how the sequins add to the effect, too! 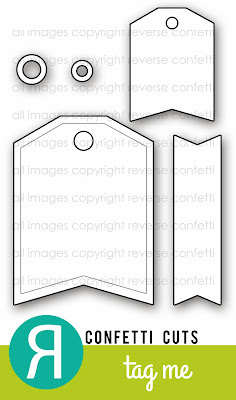 To be eligible for the prizes, just leave comments on all of the blogs in this week's hop. Commenting deadline is Tuesday, August 26. 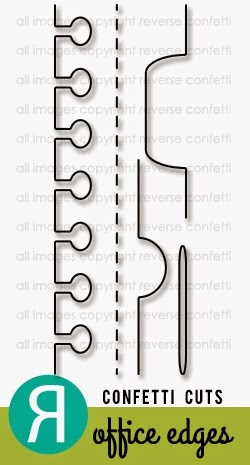 There’s also a challenge open for all to play along. 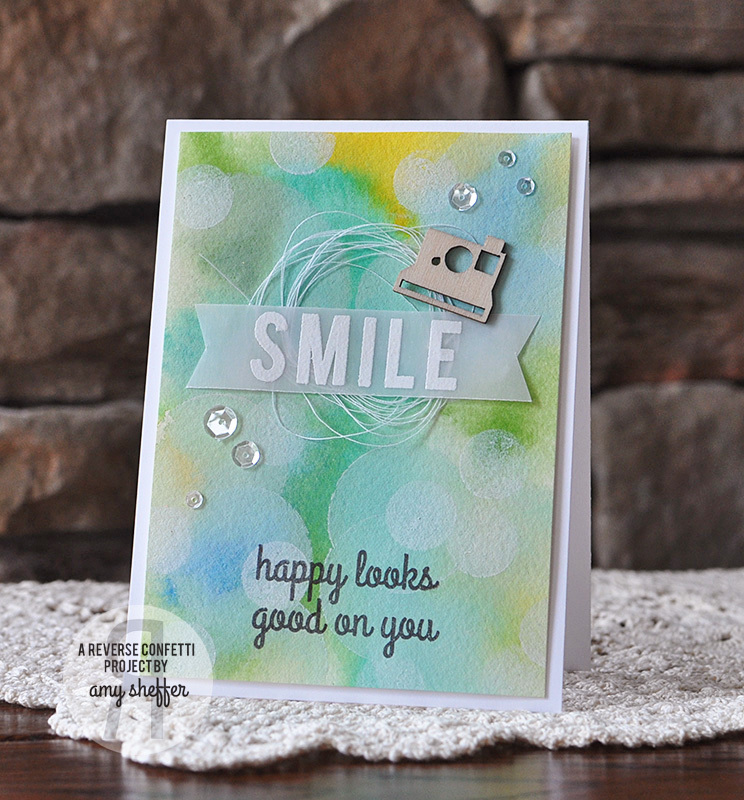 You are invited to CASE any one of the projects featured in the blog hop. Check out the blogs below for this week’s hop, then head over to the CASE Study blog for more information. Thanks for visiting, and enjoy the hop! So, last night I found myself with a rare evening alone. Like, all of my family, except me of course, was out for the evening. Which left me alone! Did I mention I was ALONE? (End-of-summer-break desperation, folks, what can I say?) I hit the grocery store for sushi and wine, and then in true introvert fashion, I retired to my studio to stamp (and watch Outlander). 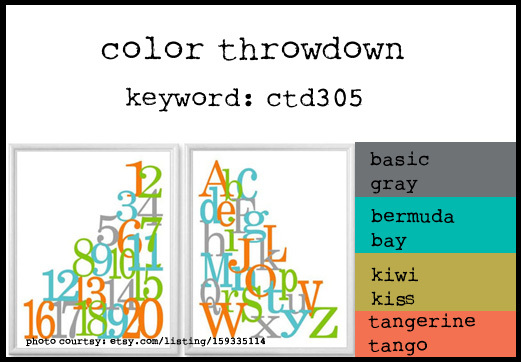 I had no agenda, so I looked through my favorite challenge blogs, and the current Color Throwdown #305 jumped out at me. 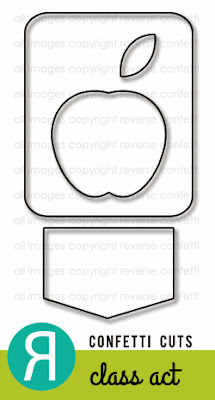 Don't you just love that graphic, with the stack of letters? It reminded me of a Crafter's Workshop number stencil that has a similar stacked look. I sponged on different Distress Inks from the same color palette (Peacock Feathers, Peeled Paint, and Spiced Marmalade), then spritzed with some Earl Grey Maya Mist to add the gray color. The sentiment banner is done with Reverse Confetti's BEAUTIFUL BANNERS stamp set and coordinating BEAUTIFUL BANNERS CONFETTI CUTS die set. The paper star accents were die-cut with Reverse Confetti's OH MY STARS CONFETTI CUTS die set, and the wood veneer stars are by Studio Calico. The "nest" of black thread adds to the graffiti look. Hello friends, a bit of sad news: Jillibean Soup's Card Kitchen kit club is closing. You can read the announcement HERE. I've enjoyed designing with these kits each month for the past (almost) two years, and am so thankful to Jill and Kimber for the opportunity to be a part of it! I've long been addicted to kits, scrapbooking kits for a long time, and now project life and card kits, so I'll be searching for another one. If you have a favorite, let me know! 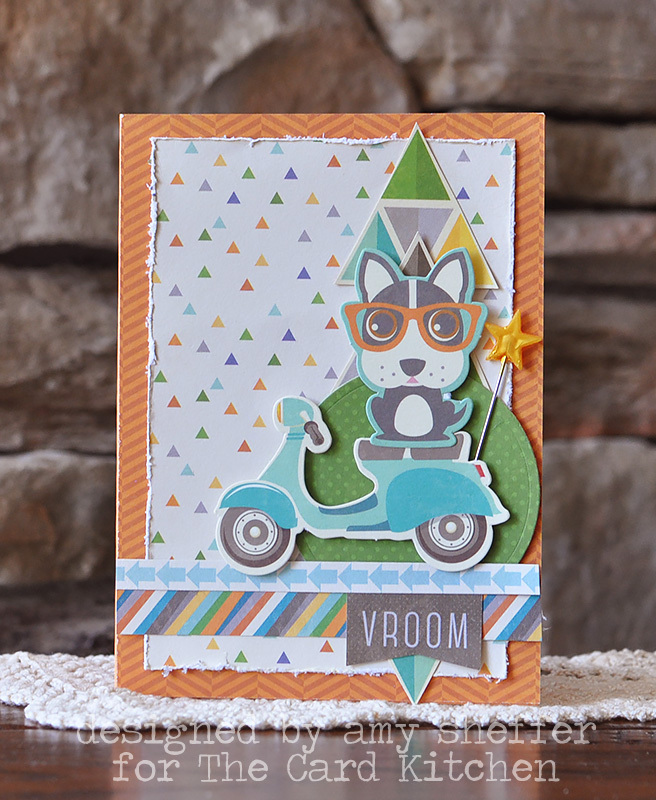 For more August kit inspiration, visit the Card Kitchen blog! 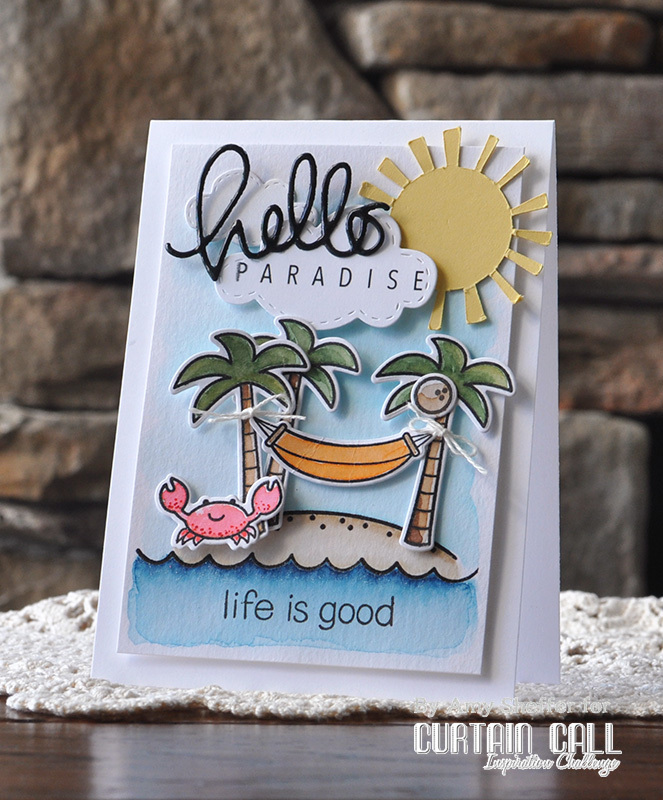 I'd love to take a trip right to this tropical scene that I created with Lawn Fawn's adorable Life is Good stamp set and coordinating dies. I started with the stamped island and water, then watercolored in the sand, sea, and sky using Tombow markers and a water brush. 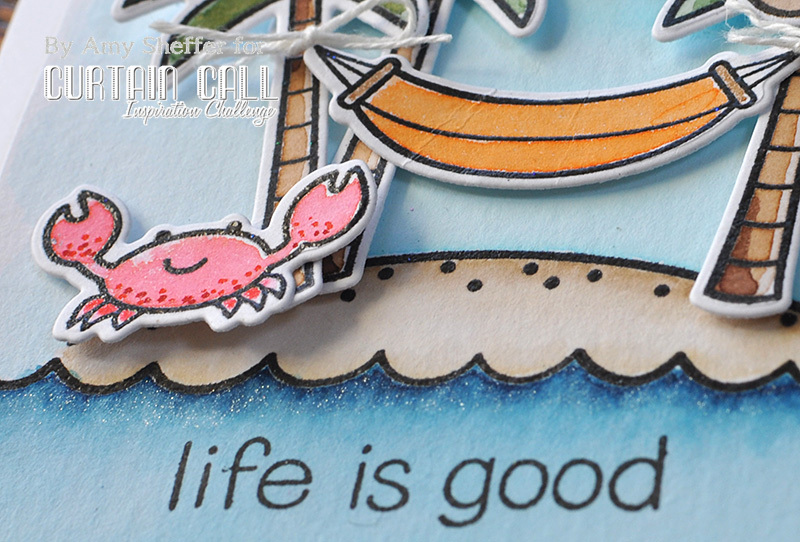 The trees, hammock, and crab are stamped, watercolored, and die-cut. The sun was cut on my Cameo (which is in obvious need of a new blade and/or a fresh, new, nice and sticky mat - my apologies for the sloppy sun!). 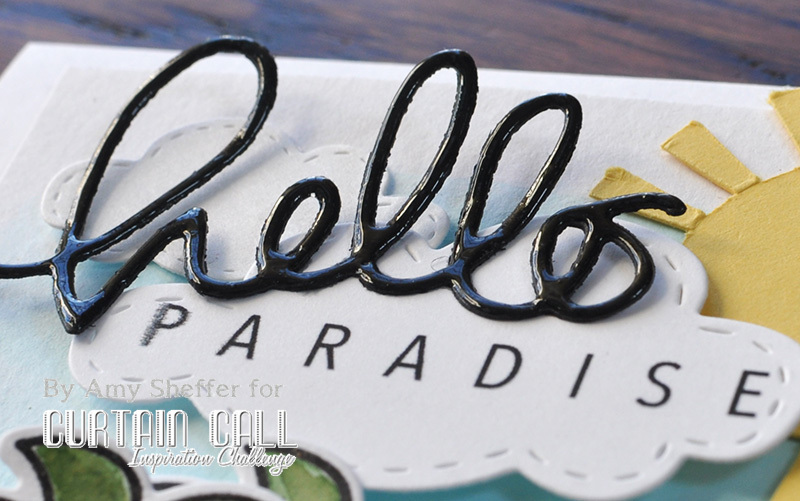 The "hello" and clouds are die-cuts (Simon Says Stamp and Lil' Inker, respectively), and the word "paradise" was computer-generated prior to die-cutting. For little extras, I added some twine bows to tie the hammock onto the trees, used a clear Wink of Stella pen to add some shimmer to the water, and coated the hello die-cut with glossy accents. 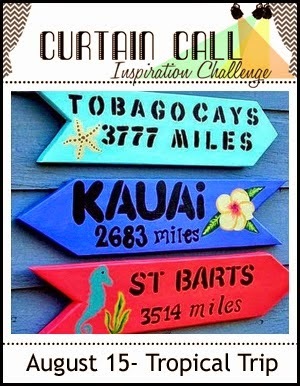 Stop by the Curtain Call Inspiration Challenge: Tropical Trip for the challenge details and to play along with us! Candles 'n Confetti Birthday Hop! We are celebrating a very special someone's birthday today! 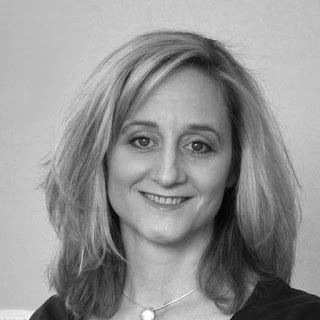 Happy Birthday, Jen del Muro! 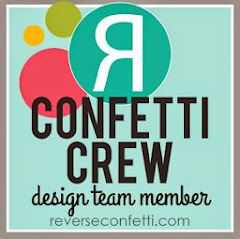 A few of the Reverse Confetti Crew and 'Fetti Friends are thrilled at the chance to surprise Jen with a celebratory hop in her honor and share birthday inspiration using Reverse Confetti! 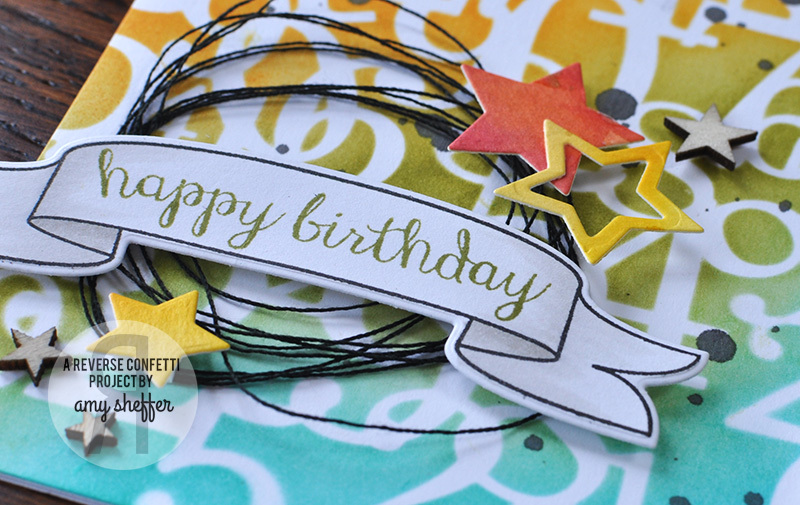 The Candles 'n Confetti Birthday Hop started over at Stacey's blog and you should've made your way here by way of Laurie Willison's blog. If not, make sure you start at the beginning of the hop so you don't miss a thing! When you're finished here, you'll be visiting Sarah Gough next. 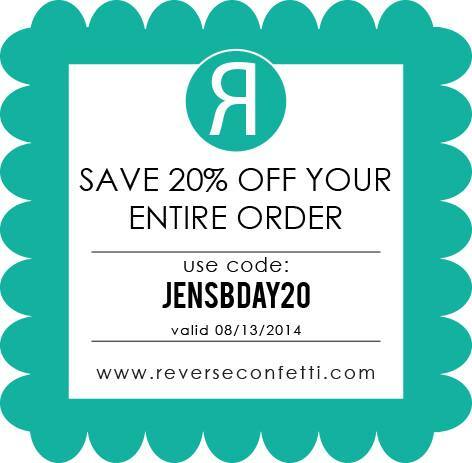 Jen is making today even sweeter with a Reverse Confetti One-Day SALE! 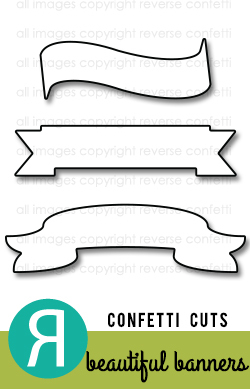 Shop at Reverse Confetti TODAY and SAVE 20% off your entire order! One more thing ... mark your calendars for August 22-25. 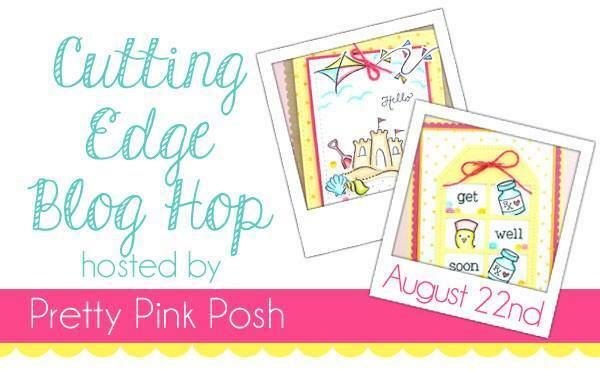 Reverse Confetti will be sponsoring a Pretty Pink Posh Cutting Edge blog hop. 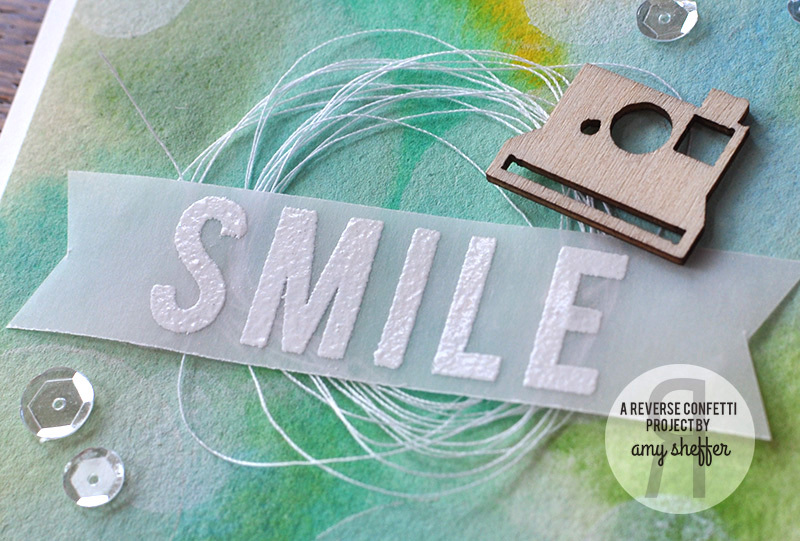 The hop will include a link-up, and EVERYONE is encouraged to join in the die-cutting fun! More info is posted HERE. 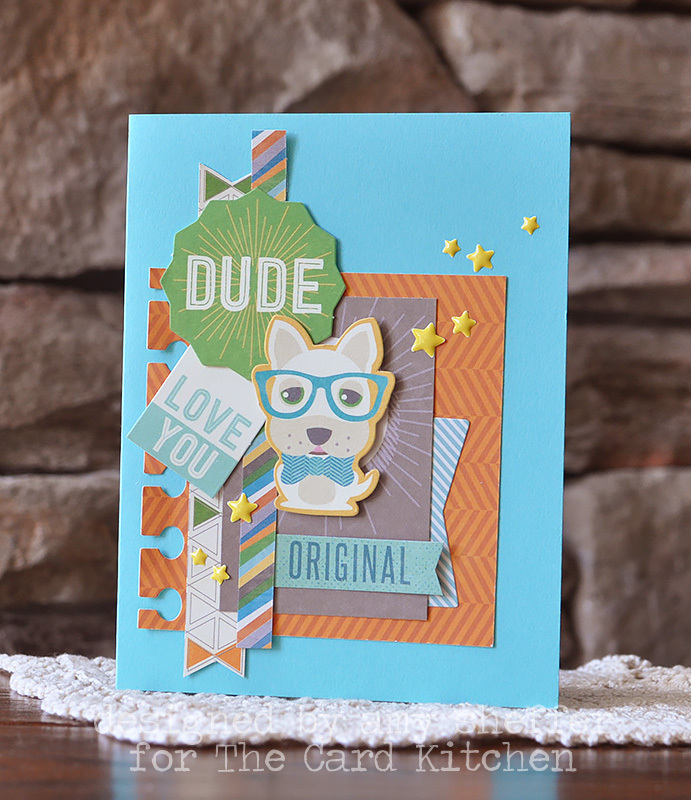 For my card, I decided to use this amazing card of Jen's as my inspiration. 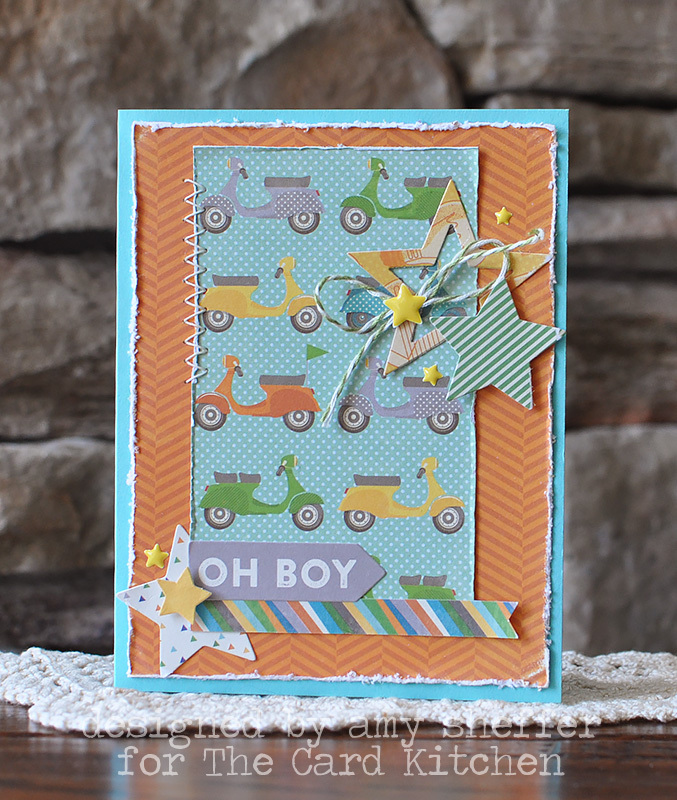 I used the same idea with the stitched OH MY STARS border die-cuts and the popped up stars. 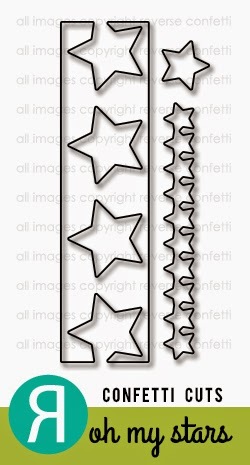 My star strips were cut from a watercolored panel that was a cast-off from a different project. The thread is a gold metallic thread that I've had for years. I love how it curls on the ends! 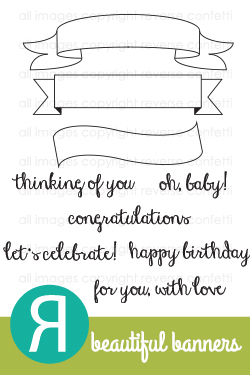 The sentiment, from CELEBRATE CAKE, is heat embossed in white. To create a kind of confetti look, I spritzed on some white ink (some gold was already on the watercolor scrap) and added some 4mm and 6mm gold sequins from Pretty Pink Posh. 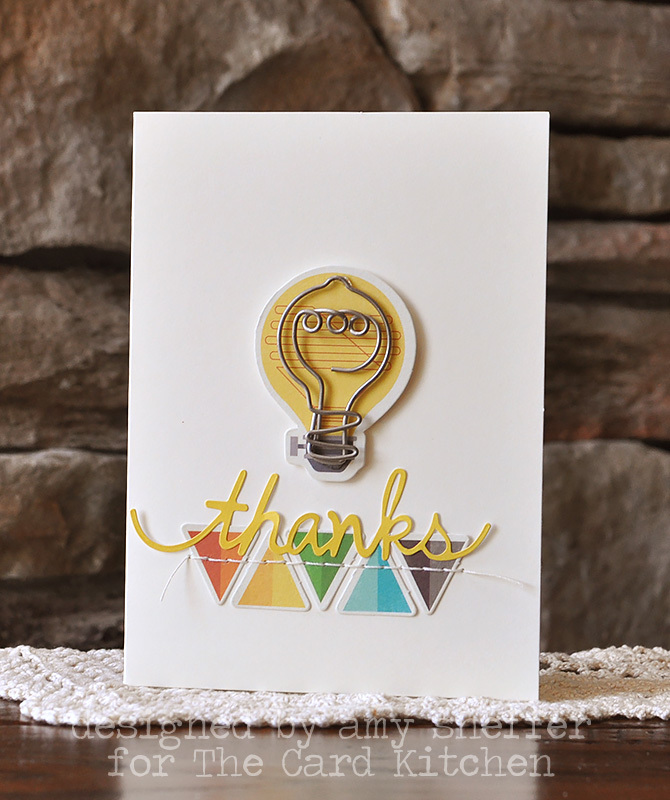 I was also inspired by the Cutting Edge Challenge #7, specifically the yellow/orange/pink combo (although my pink is more red), the stripes, and the white on kraft background. Last, but certainly not least...stop by and visit the birthday girl! 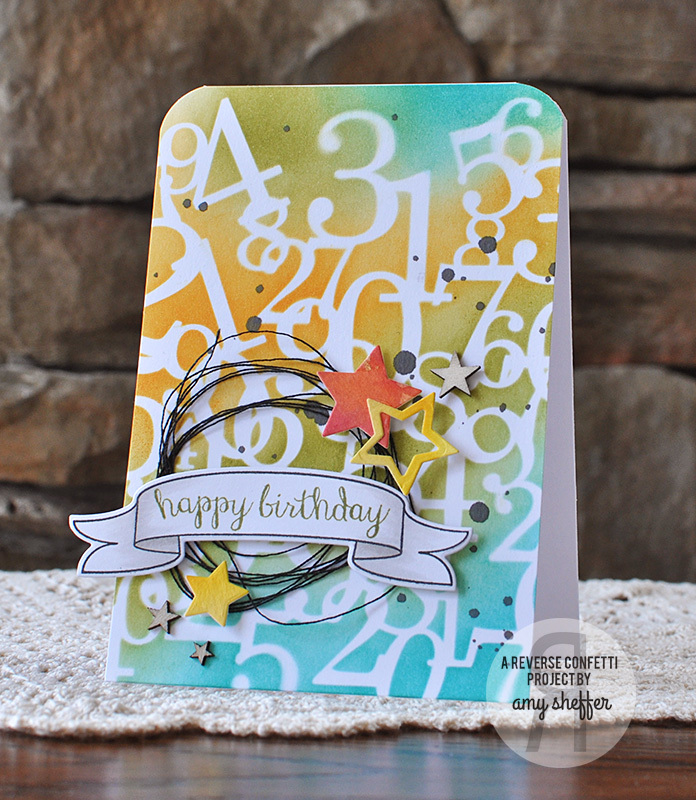 Now, it's time to hop over to Sarah Gough's blog for more Candles 'n Confetti! 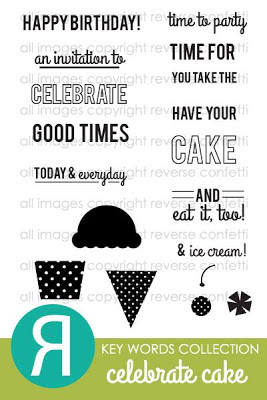 Thanks for sharing in the birthday fun today! 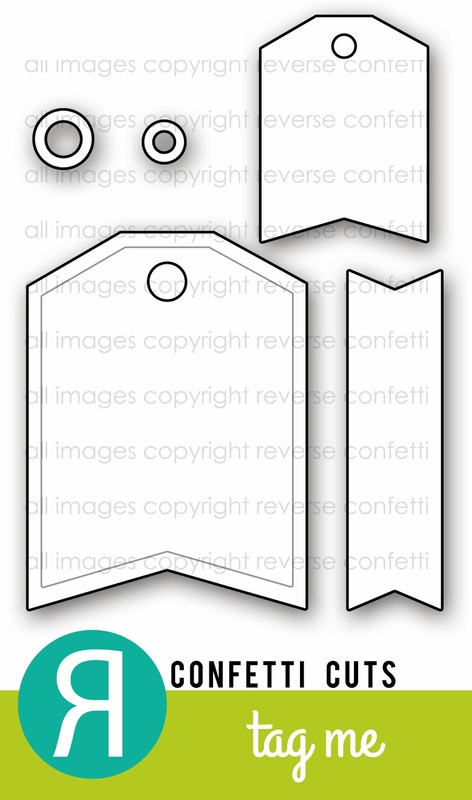 Just a reminder that the August Sketch For You To Try is still open over at Reverse Confetti. You have until noon CST on Thursday (the 14th). 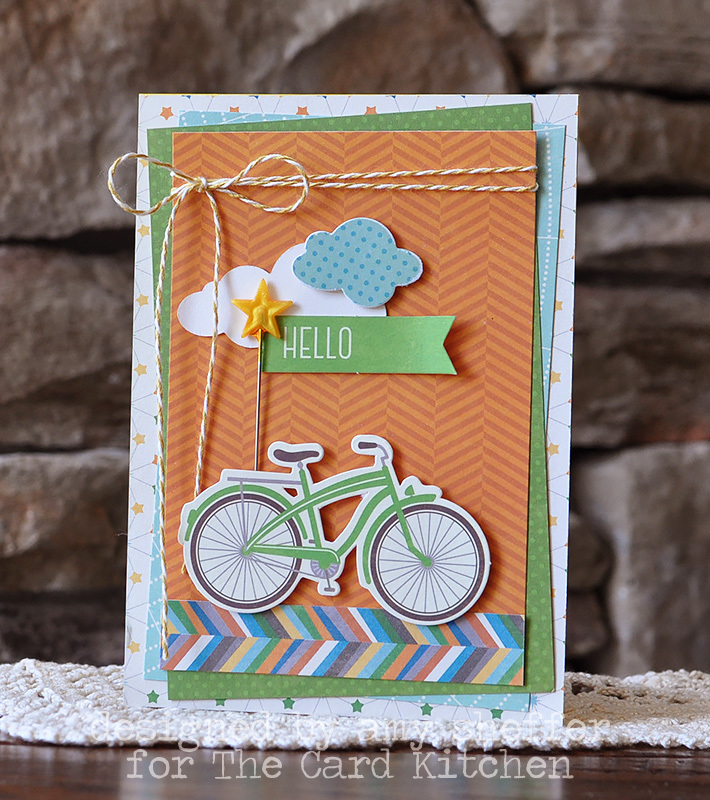 Today's card began with just putting together the different pretty papers in Pink Paislee's Hello Sunshine collection (and the sketch of course). 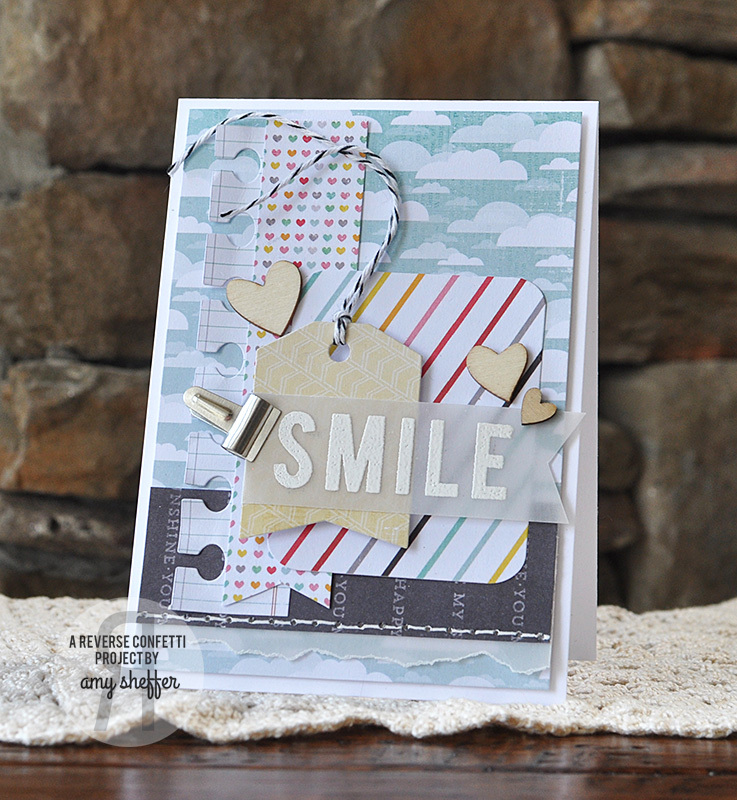 I had a few stamps out as possibilities, and in the end settled on the large SMILE sentiment from Reverse Confetti's YOU MAKE ME SMILE stamp set. I heat embossed it in white onto vellum, a look I've been loving on some of Laurie Willison's recent projects (this and this, for example).